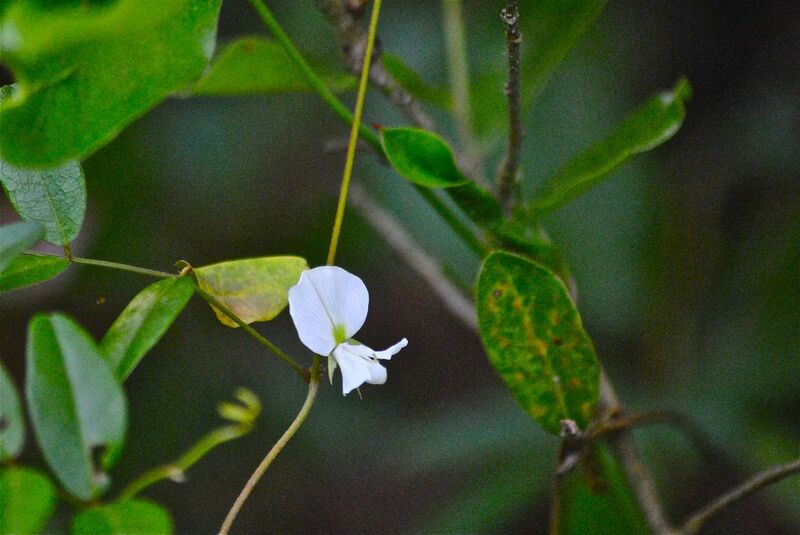 Elliott's milkpea, photographed at Halpatiokee Regional Park, Stuart, Martin County in April 2015. Elliott's milkpea, Galactia elliotti, is one of those plants that's just there. Kinda like an extra in a movie, in the background. It's pretty enough when in bloom, but not playing any major discernable role in the natural scheme of things. It's not the sole host plant for some rare butterfly (the longtailed skipper and the zarucco duskywing use it as a host, but both use other plants as well). To the best of our knowledge, it's cultural signifance is barely above zero. But we were excited to run across it, anyway. The instant you see it, with its white flower, you know you're looking at something different. And you are. 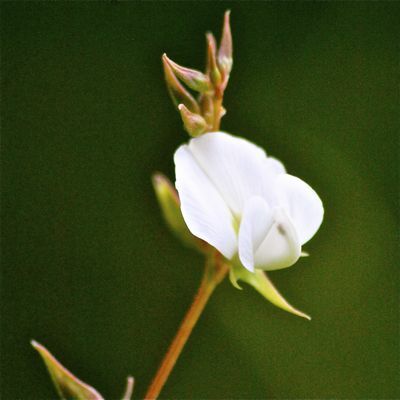 It's the only pea with a white flower native to Florida. So, ok, that is something. Elliott's milkpea is found throughout most of Florida's Peninsula from Palm Beach County northward and in parts of the Panhandle. It's also found in Georgia, mostly along the coast, and in extreme southeastern South Carolina. 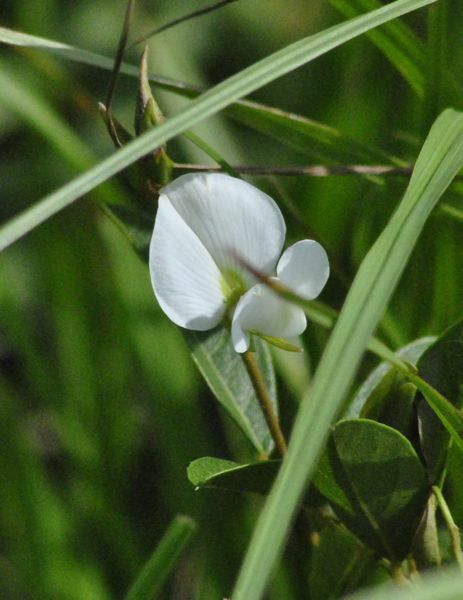 The Institute for Regional Conservation considers Elliott's milkpea rare, at least in South Florida, but it is not listed as endangered or threatened by any government agency. It's a sprawling, low-climbing perennial vine found in dry habitats, dry pinewoods, sandy scrubs and dry hammocks. It prefers full sun but it will grow in areas with some shade. It's also tolerant of drought as might be expected given where it grows. The plant on the left was found at Allapattah Flats in an area that was predominantly grasses. We've also seen growing at Royal Palm Beach Pines Natural Area and at Halpatiokee Regional Park. We've seen it spring and summer but never profuse with flowers the way we've seen other native peas. The Florida Native Plant Society says that Elliott's can be grown from seed, usually obtained from enthusuasts who are already growing it. It does have value as forage for livestock. Some agricultural scientists have experimented with it to see if it can be grown in shady areas for grazing cattle. We did see a blue butterfly nectaring on a plant as we were photographing it. As for its scientific name, Galactia is Greek for milky, as in the plant's milky sap. As for the inspiration behind Elliott, that's unclear. The obvious choice, given the plant's native range, is Stephen Elliott, the 18th-19th century South Carolina plantation owner, banker, legislator and amateur botanist of note. Naming conventions, however, point to another Elliott. Elliott's milkpea is a member of Fabaceae, the pea family.